Rachel is 30 and married. 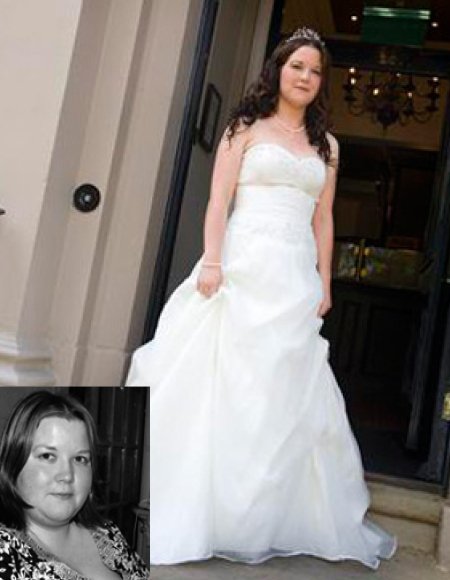 She joined Nutracheck in January 2010 and has lost an incredible 6st 7lbs91lbs41.2kg over 23 months. Read about Rachel's weight loss experience and her amazing transformation from a size 20/22 to a size 10. What made you decide to join Nutracheck? I have been fat my entire life! I was pretty chubby by the time I was about 5 or 6 years old. From my teens I reached plus size and stayed there. I probably reached my biggest point at a size UK 20/22, but in all honestly I am not completely sure about this because I never weighed myself. I was outwardly quite a confident person and being overweight wasn't the worst thing in the world. This was until my sister asked me to be her bridesmaid and I realised what a psychological issue I did have with my weight. I was also engaged myself and I really didn't want to be a fat bride. I wanted to look at the photos and smile as I still don't like photos of many other milestones e.g. my graduation due to my size. I didn't want to feel like this about our wedding photos. The weight fell off - why had I left it so long to do this? Have you tried other diet plans / programmes before? What was your experience like? Not really! I have half-heartedly tried increasing the exercise levels and eating a bit less, but I have never really dieted in my adult life. I was pretty aware of what I needed to do, but it just took me a long time to reach the right frame of mind to be able to take action. I do remember being put on diets by the nurse at school, but don't remember much about them. What has been the key to your dieting success? Realising it really isn't that difficult if you just stick to the plan and you are honest with yourself. I actually felt pretty silly once the weight started to fall off - why had I left it this long before I had done this before? What are your top three pieces of advice for other dieters? 1. Weightloss really is in the kitchen! Exercise helps, it is a great motivator, but unless your diet is under control you won't get very far. Cook meals yourself from scratch. If you do this you really can eat quite reasonable portions of nice food, even on a low calorie diet. Do not kid yourself; a bit of ironing or a short walk is not going to burn off a huge slab of cake. Weigh and count everything. Don't cut out the things you like. I still eat cakes! In fact, I probably bake more now than I did in the past, but I am aware of what I can get away with and what I can't. 2. Use the nutracheck forums. They are very supportive, you are not alone and you can succeed. 3. Start a weight training program. Girls, this is not going to make you into the incredible hulk! Women have to be eating a lot and usually take un-natural methods to end up very bulky. As you lose the weight you really want a reasonable amount of muscle or else you will look skinny and unhealthy. Do squats, deadlifts, press-ups and pull-ups. Look into kettlebell training, although always seek professional advice as it is easy to hurt yourself if you don't know what you are doing. How have you made the diet fit into your lifestyle? Or have you adapted it for your new healthier way of life? I have made being healthy a priority. I have a busy life and work schedule. I am a teacher and I also have quite a few time consuming hobbies, but when I started on NC I promised myself that I would stick to a few changes no matter what. These included: eating breakfast, taking lunch to work with me rather impulse buying at the canteen and going swimming before work. I am not really a morning person, but now it is routine. In the past I have tried sticking to swimming before work, but as soon as it gets busy I would bow to the pressures of being in work early to do x,y or z. I simply don't let this happen now. Have there been any success milestones (e.g. fitting into an old pair of jeans again/ looking great for a wedding or special occasion/ getting compliments)? In August 2010 I was bridesmaid for my sister. The dress was measured as a size 20 and was taken down to a size 14 for the day. To be honest, I would have been happy to just be a size 16 and able to buy clothes from 'normal' shops, but once I passed this milestone I realised that I could do it and actually become slim! 11 months later was my wedding and at this point I was approximately in a size 10 dress. Unbelievable really as I haven't been under a size 16 since I was a young teenager! I feel great. I am not completely happy with my body, but I am proud of how far I have got. I think I look pretty good now and can look at photos without wanting to censor them all! How do you keep motivated? How do you stay on track if you're feeling low/ out of control? Working with my personal trainer has been a big motivator for me. It helps me keep readjusting my goals and now it isn't just about being less fat, it is about being healthy and increasing my fitness and strength. I do have cravings for sweet things, but on the whole I let myself have a treat if I wish. As long as it isn't something huge it isn't the end of the world and I usually manage to balance things out over the rest of the week.